I know, I know. I am very delinquent. This is how the concert last Thursday went. My orchestra is associated with the local university hospital, and was originally started to give the musician physicians an outlet for performing. When this group of players proved somewhat unreliable ~g~ it expanded to include other employees, family members, and interested community players. They used to perform in the hospital lobby, always well-received, until the lobby was remodeled. First the construction, then it was smaller, then some bean counter decided it wasn't a place for concerts, anyway. This was our second concert at a new venue, one of the churches on campus. We played in the moderately-sized sanctuary, stone finishes, wooden pews, two-story walls with the stained glass windows placed high. As we discovered last time, these are in exactly the right position for the sun at noon to stream down into the faces of the cello section. The strings set up on the floor between the first row of pews and the pulpit area (which probably has a more specific name that I don't know), which was 6 steps higher, and upon which four rows of brass and woodwinds set up in a compact square, with percussion in the far rear. I have no idea how that worked acoustically in the sanctuary. From the floor, I could hear the winds much better than the strings, and myself not much at all, but took heart when the Maestro shushed us a few times that I was actually making some sound. I really enjoyed hearing the Elegie with orchestra instead of piano. 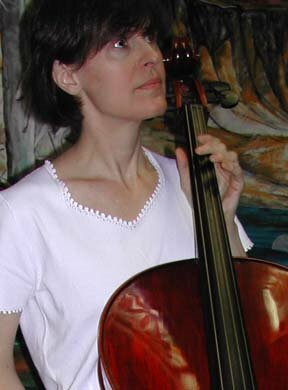 Our parts were a gift to the orchestra, presented by the principal cellist's wife, who is also the principal flautist. Isn't that sweet? I think they have played with the orchestra since its inception 13-or-so years ago. J- has played cello since childhood, and said he first learned the piece as a teen by sounding it out after hearing it on the radio. You know, I can't remember the last time I heard it on the radio. The most entertaining moment of the concert (for me) happened just after Elegie, at the beginning of Hansel and Gretl. We had very little rehearsal time on this piece, it being the last-minute substitution for the Bach Double after the recent injury of one of the violin soloists. We played it at our last concert, and I was really happy when we turned that music back in. So it wasn't exactly an old friend, and I decided that with no time to practice properly I was just going to practice my faking skills. But that's not the entertaining part. The Overture opens with a brass chorale for 7.5 measures before the strings enter together. J- had just moved his chair back into position next to me, and was regrouping after his lovely performance of the Faure. He's sitting there counting. We're both sitting there counting. I get ready to play, confident about where we are to begin because of both my count and the auditory cues. He's still counting with the bow resting in his lap. That makes me a little uncertain, but I *know* we're supposed to start now. The strings come in. He scrambles to get going, omitting the customary flourish with which he brings in the section. I am having a great deal of difficulty containing my mirth. I like playing with J-. The concert was fun, and yes, I think it sounded well. I believe it was recorded, and if we get access to the mp3s I'll share a bit with you later.